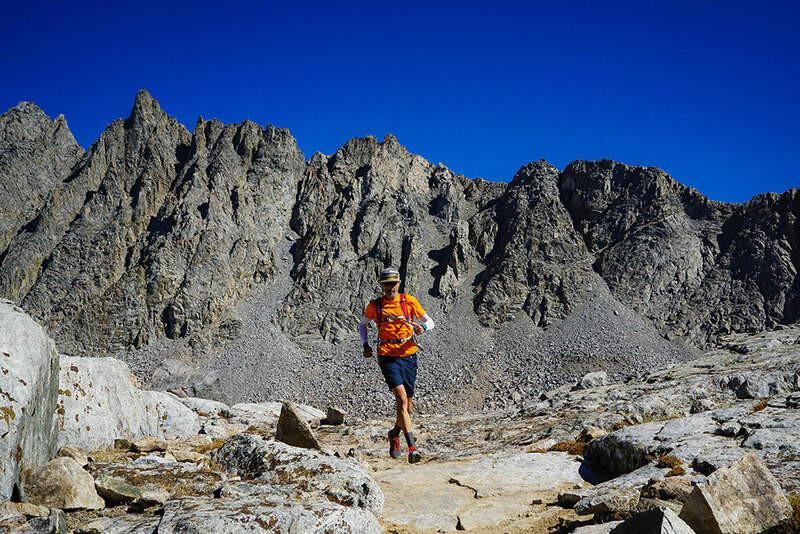 The author running trails in the Eastern Sierras. I’m currently sitting in a dark, though not seedy, bar on Broadway in Tucson, AZ. In front of me on the heavy, wood slab table is my notebook, pen and pint of a tapped and locally brewed Mexican amber beer. Reggae is playing on the overhead speakers and ESPN is silently illuminating the screens above the bar. There are less than a handful of people in the joint, but it is early. The streets are equally lit by a dimming sun and warming street lamps. While the sun doesn’t set quite as early as in the Pacific Northwest, it is still dark here by 5:30 p.m.
Local pubs and cafés have recently become a staple in my life. Not because I’m in need of alcohol or caffeine, though as I may have expressed in the past I do love a good pint and Americano. Rather, pubs and cafés have become home for wi-fi, and a comfortable place to spread out and work. As it stands, I’ve been voluntarily homeless for five months now. I chose to move into a 1993 Chevy van, along with my partner Susan, that has six figures on the odometer, suspect brakes, and wire shortages that render half the electronics unusable (which unfortunately includes Susan’s passenger side window). While neither she nor I are twenty-somethings, we were discontent with the direction our lives were heading as we each approached our mid and late forties, so we decided to make a change. With aspirations to do more with our time and our lives, we embarked on a journey this past September that will take us around the west doing more of what we think needs doing. At times this feels selfish because it is also what we want to be doing. What needs more doing, for us, includes writing, running, engaging in the wilderness and with people, and having real conversations with those people. This writing, running, and engaging is an effort to educate others as to why trails matter. Why do trails matter? Trails matter because they represent and remind us of a simpler life, when we hunted, foraged, and communed with Nature. For the most part, running on trails demands only a pair of sneakers, dirt and trees, silence and desire. Trails matter because they connect us with something greater than ourselves, as well as more deeply with our own self. When spending time on the trails in nature, we are reminded of our insignificance. We are small, short-lived creatures on this expansive sphere. Yet, we also hold the most power and influence. That influence should be directed by a responsibility to preserve resources and a desire to serve those who are less fortunate. Trails matter because wilderness and specifically movement in nature, is a foundation of mental wellness. It is fundamental to our health. Both Susan and I, having had our personal battles with depression and still feeling the occasional aftermath of depressive moods, understand the importance of movement and the importance of nature independently. Pairing movement and wilderness can heal the body and mind, as well as help build a resilience against the physical and mental tolls our modern lifestyles place upon us. Trails matter because they are a neutral ground of equality. When running trails I see no race or socioeconomic differences. Nature strips individual identities and classes. We simply become the human race. Trails and public lands find themselves in the political landscape of late because the conversations are happening within walls, not trees. If politicians were forced to take field trips or enroll in summer camp, as most of us did when we were children, perhaps those conversations wouldn’t be necessary. Trails matter because they create unexpected opportunities. While my intentions were to run, write and educate, I didn’t expect we’d meet as many like-minded individuals as we have. The conversations Susan and I are having seem to be echoing across the west. There are many of us who genuinely want to live a simple existence, away from the hectic hubs of lights and gastronomy, gigabytes of streaming data, and McDonald’s delivery. Leaving Central Oregon with the intention of running trails and sharing our stories has opened doors I had built which impeded my own growth. I have forced myself to be less introverted, less fearful of connection and dialog. In doing so, I have been blessed to have met fellow runners, other vagabonds in vans, those who have dealt with depression and who seek solace in the wilderness, running heroes that have impacted both Susan and I in silent ways, families on mountain tops with young daughters inspired by our running, older couples and the occasional eccentric north of middle-age man sharing trail knowledge only he was privy to (turns out the trail map was more accurate). I’ve discovered that by-in-large, people are kind and want to be helpful. Across the many states we’ve traveled thus far, we have been offered a couch, a few meals, a jumpstart, and simple directions to the most authentic taco in town. In Tucson I recount the miles, on road and trail, no less than 4,000 miles have been covered in the van with more than 500 miles by foot on trails from Bend, Oregon to Ketchum, Idaho to Bishop, California, through the Red Rocks in Nevada. Now, from the Arizona Trail we will continue moving south then east toward New Mexico and Texas. We are only four months into our trip and remain eager, though at times satisfyingly weary, to see more of the mountains and desert trails this country has to offer, and more of the people that also find themselves drawn to the less beaten path. Paul Lieto is the Editor for RaceCenter Magazine. He currently lives on the road where he writes, runs trails, and helps others live a more vital life. He is co-founder of Dirty Good Company. Follow Paul at dirtygood.co and @dirtygoodco on Instagram, Facebook and Twitter.